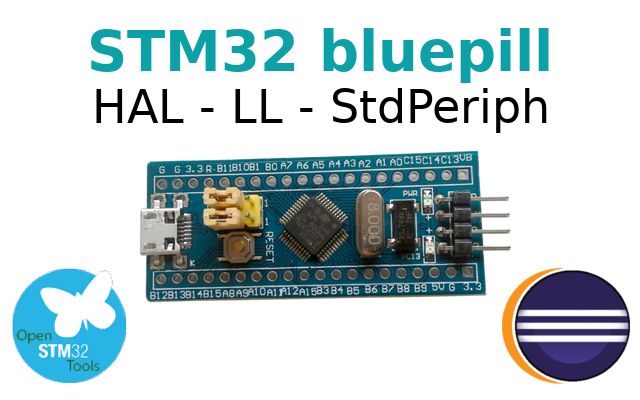 The "blue pill" is an STM32F103 based development board. Although it is less popular, the board is cheaper than an Arduino Nano. More than that, STM32F103 is a device with Cortex-M3 ARM CPU that runs at 72 MHz, 20 kB of RAM and 64 or 128 kB of flash memory. 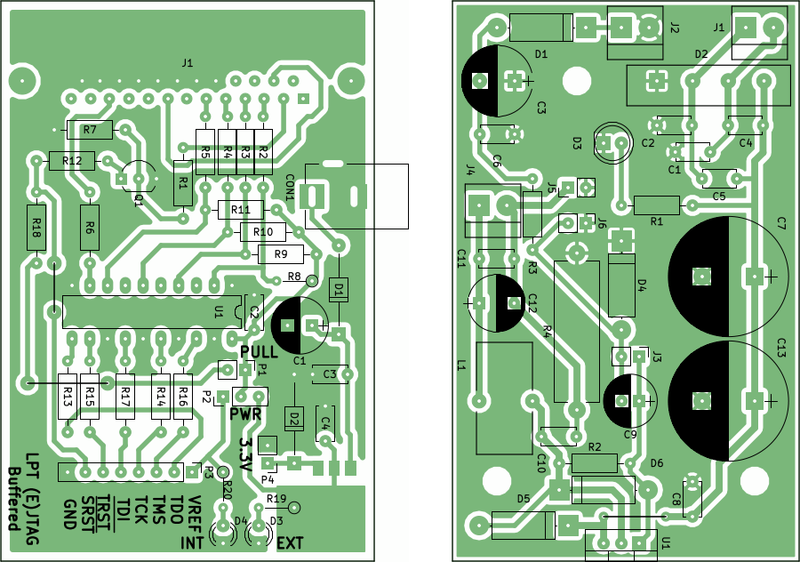 The microcontroller (MCU) has USB port, two serial ports, 16 bit PWM pins and 12 bit ADC pins. It runs at 3.3V, but some of its pins are 5V tolerant. Unfortunately programming this board is not as easy as programming an Arduino board. 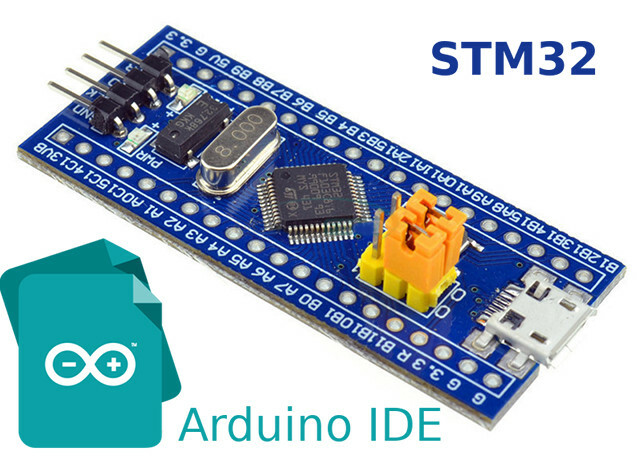 There is a project named STM32duino aimed at simplifying things which makes use of Arduino IDE and similar programming language. 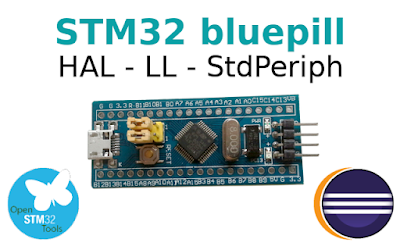 But, STM32 is a complex CPU with more functions than Arduino language offers. You can program it using Eclipse IDE and a set of libraries offered by ST. These libraries are LL (low level), StdPeriph (standard peripheral library) and HAL (hardware abstraction library). HAL uses high level API which simplify developing an application. 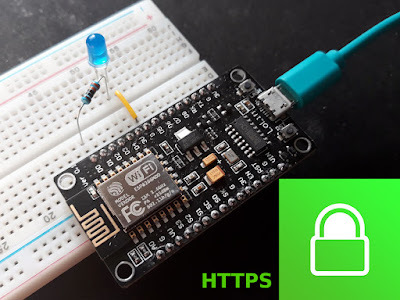 This post will show you how to configure the development environment and write the first program with HAL that will blink an LED. An easier alternative to Eclipse and HAL is PlatformIO and Mbed. Check it out. 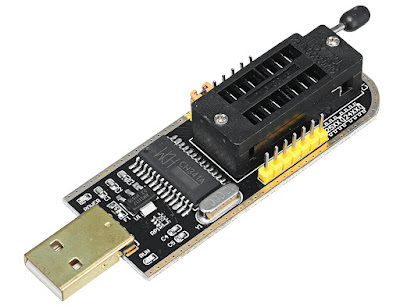 CH341A is an USB interface chip that can emulate UART communication, standard parallel port interface, parallel communication and synchronous serial (I2C, SPI). The chip is manufactured by Chinese company Jiangsu QinHeng Ltd.
CH341A is used by some cheap memory programmers. The IC is somehow limited in this configuration, because the programmer makes use only of the SPI and I2C interface. A popular device is the so-called "CH341A MiniProgrammer" that you can buy for 2 to 5 USD. And this is probably the cheapest device using CH341A. If you got a "MiniProgrammer", you may want to use for more than memory chips programming. 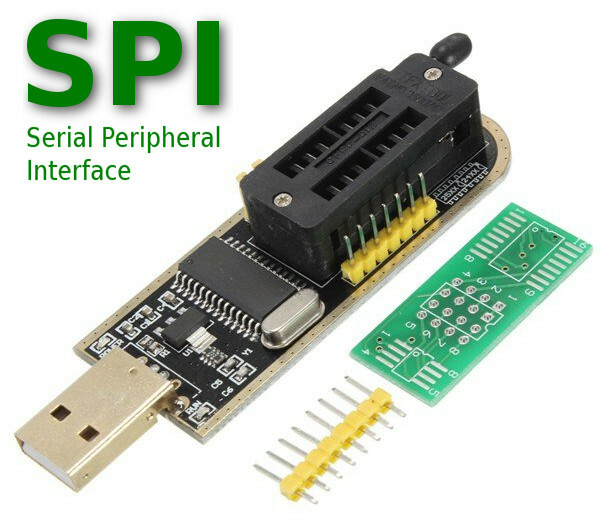 The device can actually be used as USB to SPI converter (not only SPI, but this article will focus only on SPI function). Let's see how to use the included library and header to communicate with SPI peripherals. This is the classic circuit that uses NE555 timer and CD4017 counter to generate a sequence of pulses. If these pulses drive LEDs, a chaser can be built (also known as water flowing light). It can be used for entertainment purposes or for various light signaling. 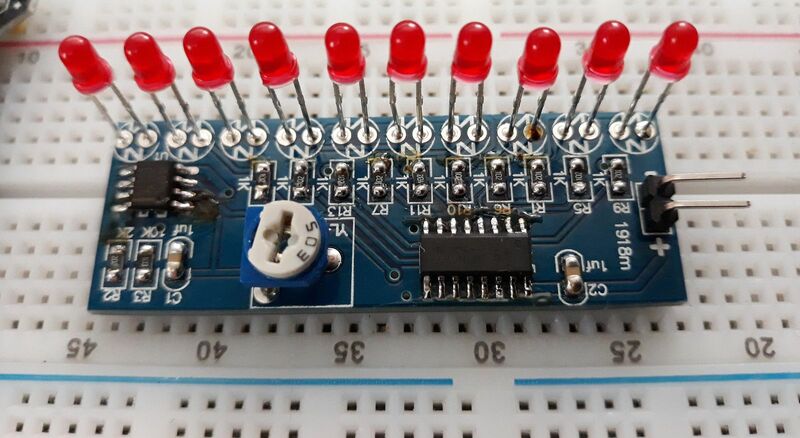 The following circuit uses 10 LEDs that turn on in a regular sequence. This is the maximum number of outputs. 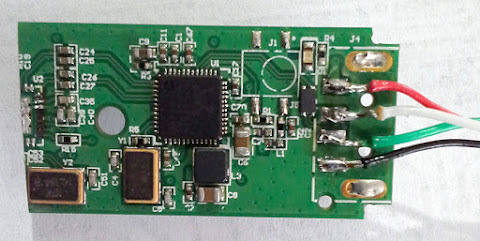 If you need less than 10 output channels, CD4017 features a reset pin that is connected to ground. The following output pin after the last used pin can be rewired to reset (after disconnecting it from ground). Thus, once the pulses sequence reaches the reset pin, CD4017 will start over again, limiting the number of output channels. NE555 is configured as an astable multivibrator. Oscillation frequency is rather low for this application. It is determined by R1, R2+RV1 and C2. 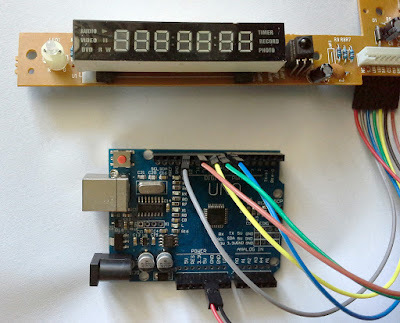 With the values used for this circuit, it can be adjusted between 10 and 65 Hz. The duty cycle is close to 50%. If you want to calculate it yourself, use this tool. A stepper motor is a brushless electric motor that rotates in small equal steps, as opposed to the continuous rotation of regular motors. It has the ability to rotate a predefined number of steps, being made of multiple coils that are energized in regular sequences by trains of digital pulses. Unipolar motors use two coils, each of them having a center tap. The center taps from both coils connect to a power line and the remaining four coil terminals are powered sequentially (5 wires). A simple transistor driver, motor connections and driving methods were discussed in the previous post: Unipolar Stepper Motors: Arduino Code and Driver. Some basic C functions were provided there. But, those functions are too basic for most usage scenarios. 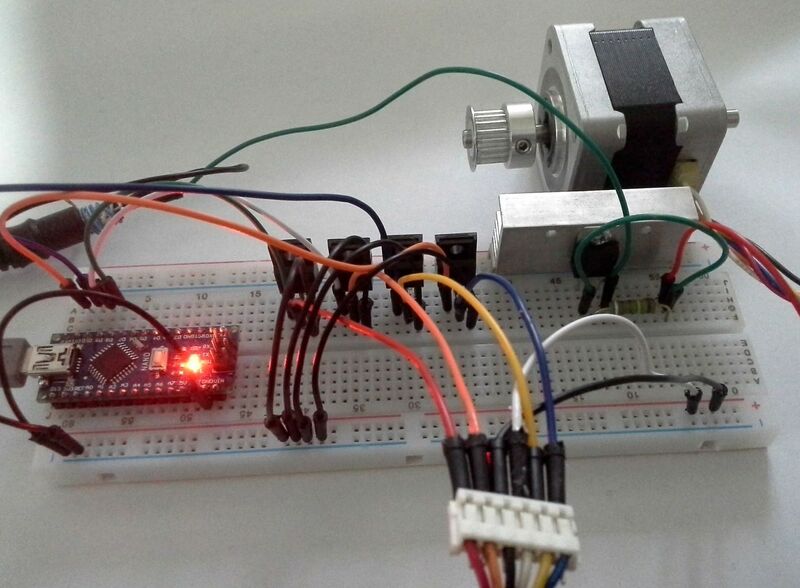 The motor can be driven only in 4-step increments and you can't change rotation direction. 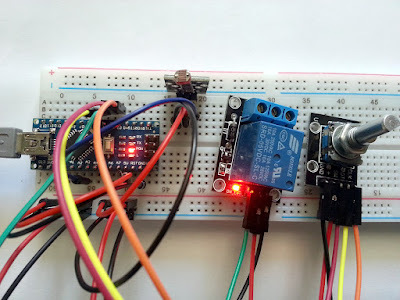 In this post, I will explain further the driving methods and I will generate driving pulses programmatically, with the ability to move in 1-step increments and change the rotation direction. A stepper motor is a brushless electric motor that rotates in small equal steps, as opposed to the continuous rotation of regular motors. It has the ability to rotate a predefined number of steps, which makes it useful for precision mechanical devices. To do this, it uses multiple coils that are energized in regular sequences by trains of digital pulses. The speed of these pulses determines also the speed of the motor. The pulse sequence determines the rotation direction. 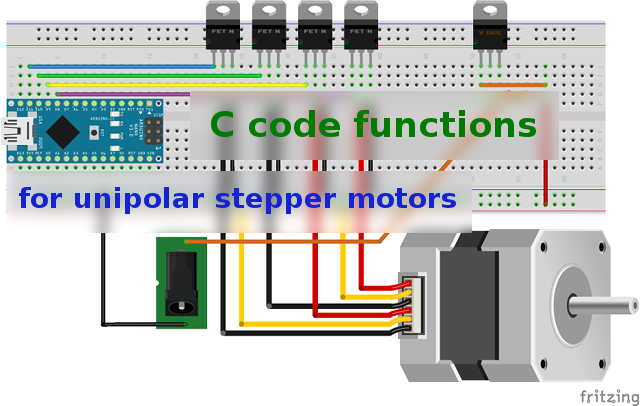 There are two main types of stepper motors. There are bipolar motors which contain two coils (4 wires). To drive these kind of motors, coils are energized one after another, then polarity is changed and the coils are energized again. Tow H-bridge circuits are required in this case. Unipolar motors use two coils, each of them having a center tap. The center taps from both coils connect to a power line and the remaining four coil terminals are powered sequentially (5 wires). This simplifies a bit the driving circuit. Some manufacturers offer steppers that can be used either as unipolar or as bipolar. These kind of motors have the center taps not connected together (6 wires motor) and if the center taps are not used, the motor is bipolar. DRM (Digital Radio Mondiale) is the universal, openly standardised digital broadcasting system for all broadcasting frequencies, including the AM bands, as well as VHF Bands. The great flexibility of DRM supports all types of coverage needs – from local, regional, nation-wide to international. If you want to listen to DRM broadcasts, you need a dedicated receiver or a software radio. 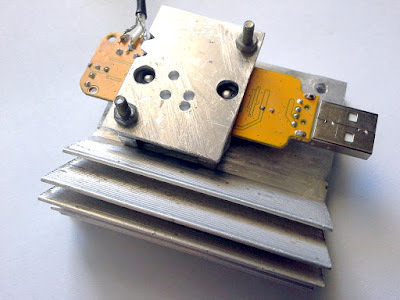 This post will focus on the cheaper method, the software defined radio (SDR). 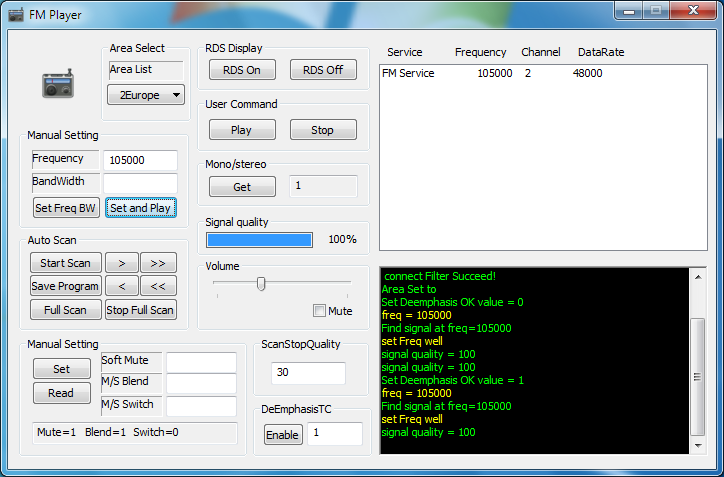 SDR performs demodulation in software. The RF signal is sampled by a high speed ADC (analog-digital converter) and sent to a computer which does the filtering, amplification, demodulation and decoding of the signal. The cheapest hardware for SDR is the popular RTL2832U based DVB-T stick. Most DRM broadcast can be found in SW bands. Here comes an important issue. The tuner from the DVB-T stick can't receive this band. One of the solution is to add a frequency downconverter. Or you can simply disable the tuner and feed RF straight to the ADC. I wrote about RTL2832U direct sampling in this post. This method has some limitations, but nevertheless it should provide satisfactory results. 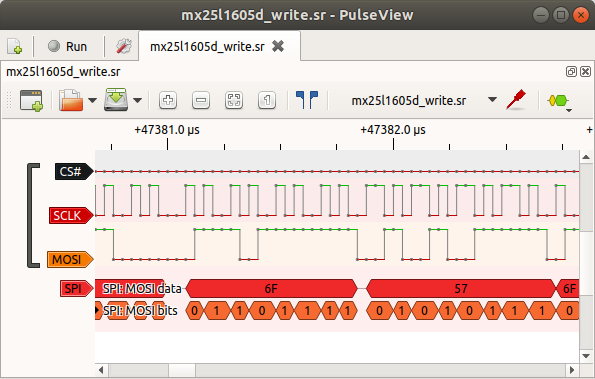 PulseView is an opensource GUI for sigrok. It displays recorded waveforms from logic analyzers and oscilloscopes and it can perform various signal measurements and digital protocol decoding. Being opensource and Qt based, it is also cross platform. You can find it in the Ubuntu repositories, but the version is rather old and you'll be missing some new features and protocol decoders. You will find in this post a script based on building instructions from official sigrok/PulseView wiki that automatically downloads, builds and installs all required dependencies and PulseView itself. The script has been written and tested on Ubuntu 17.10 but it should work on other apt based distros. Light or dark activated relays are useful devices when you need to automatically turn on lights or activate some other electric device when lighting decreases or increases above a threshold. Usually, to build such a device, you would use a LDR (photoresistor), some resistors to make voltage dividers, an opamp as comparator, a transistor and a relay that will be driven by the transistor. 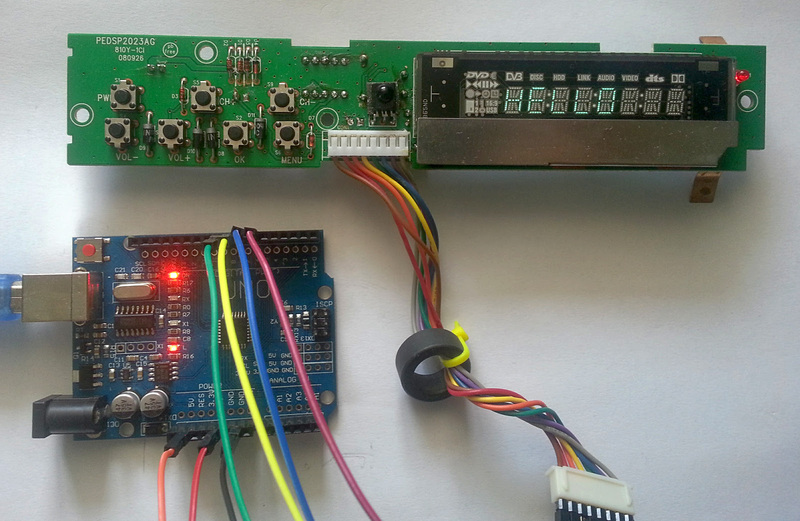 Using a microcontroller we can design a smarter device. One that does not activate the relay at every instant change of light (flash). The same device can turn from a dark activated relay into a light activated relay at a push of a button. 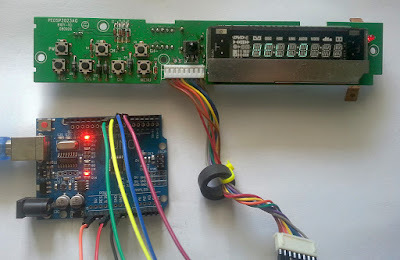 The following project uses an ATmega328 board with some modules which are part of a popular Arduino sensor kit. Don't worry if you don't have that modules. They are simple circuits for which I provided schematic. The toner transfer method is a cheap and easy way to make your own printed circuit boards (PCBs) at home. A laser printer is used to print the design on paper. Not all paper types are suitable for this kind of usage. 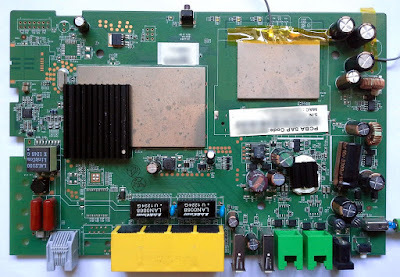 The paper is placed with the printed side over the copper side of the circuit board and then the whole thing is heated. Most people use with good results a common iron, but if you have a laminator, use it instead of the iron. When heated, toner melts and sticks to the surfaces. The idea is to make it stick to the copper layer. After heating, the board is submerged in water and the paper should be easily peeled off from the copper side. A good transfer means no toner remains on the paper. Once this is done, the board can be etched using whatever method you want (ferric chloride for example). This method is widespread among hobbyists because is cheap and easy. However, for some, the results are unsatisfactory and variable. I will share some of my experiences with this method. If you ever wanted to pipe an audio stream from an application to another, you probably know that there are some virtual sound card drivers available for Windows. But what about Linux? Well, there are a lot of options, some being more complicated than others. 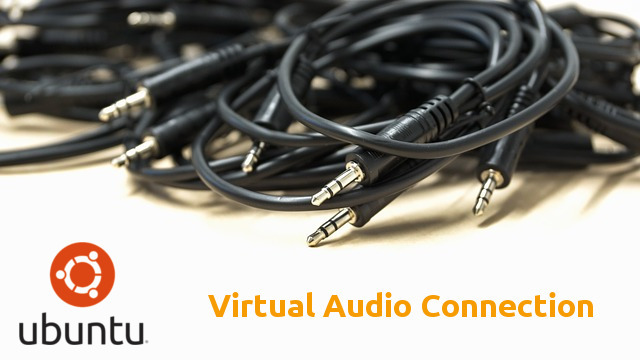 You probably need to do audio piping to record an audio output or to use SDR tools which only support audio input. You don't have to use a real cable to wire the sound card output into line in. The software approach is better. There is more than one way to do this in Linux. We'll look into Pulseaudio and ALSA, the sound servers used by Ubuntu. Depending on what application you use, you may need to configure the virtual connection on one or the other server. PonyProg is a software application that can read, write and program various memory chips and microcontrollers using the simplest possible interface: a serial port adapter. This adapter consist of only some resistors and some voltage limiting zener diodes. However, this approach has a big downside nowadays. It doesn't work with USB to serial converters. And computers with a real serial port are becoming very rare. If you still have an older computer with a motherboard serial port, you may take into consideration building the serial adapter used by PonyProg, because it is easy to build and probably the cheapest programmer possible. The schematic of the interface can be found at the author's page (SI-Prog by Claudio Lanconelli). Currently, PonyProg only support SI-Prog or other serial based programmers and some parallel port programmers. With serial port, it communicates by bit-banging various protocols to the signaling lines contained in the RS232 interface (RTS, CTR and DTR). 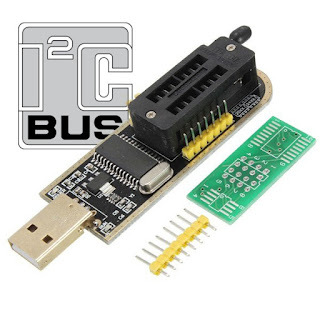 It would be nice if a future version would support the modern USB based programmers (like the CH341A MiniProgrammer) which lack a good software. If you got a "MiniProgrammer", you may want to use for more than memory chips programming. The device can actually be used as USB to I2C converter (not only I2C, but this article will focus only on I2C function). Let's see how to use the included library and header to communicate with I2C devices. Some of the popular RTL2832U based DVB-T dongles that can be used as SDR tend to heat too much. As temperature increases, frequency drifts and sensitivity drops. Some dongles, especially those using R820T may stop working at all at high temperatures. 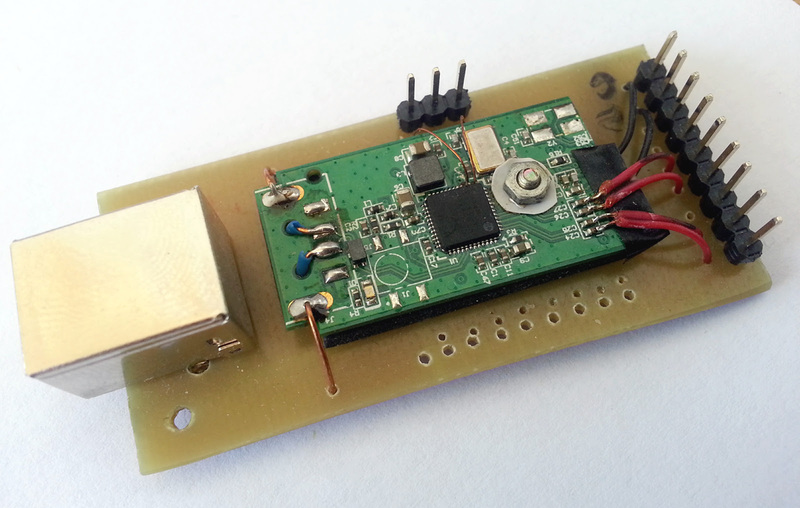 Marko Cebokli (S57UUU) used a thermal camera to measure the temperature of the dongle. 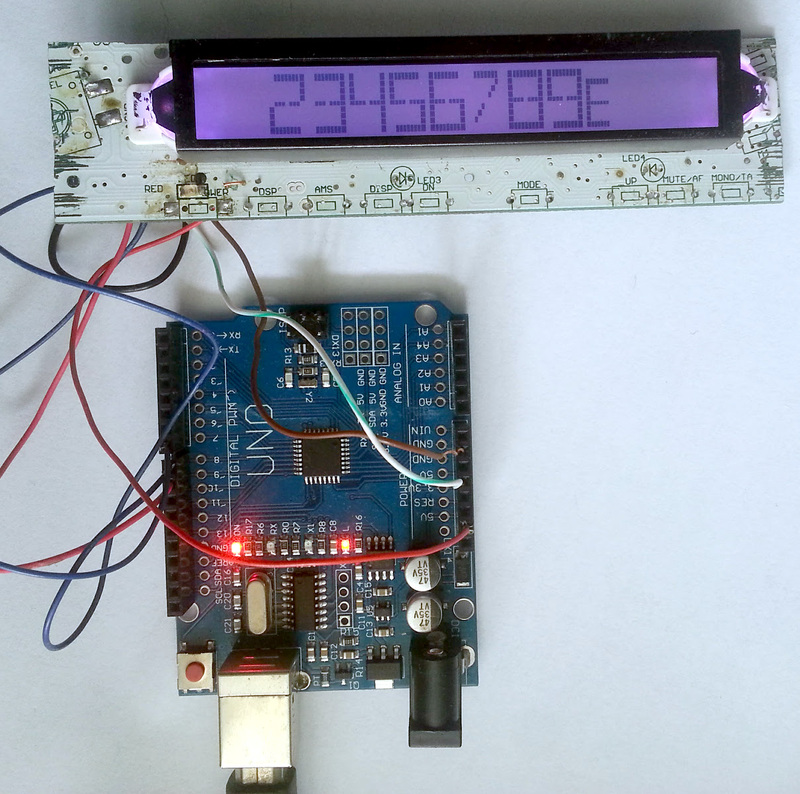 He measured up to 85°C at the tuner chip (R820T). 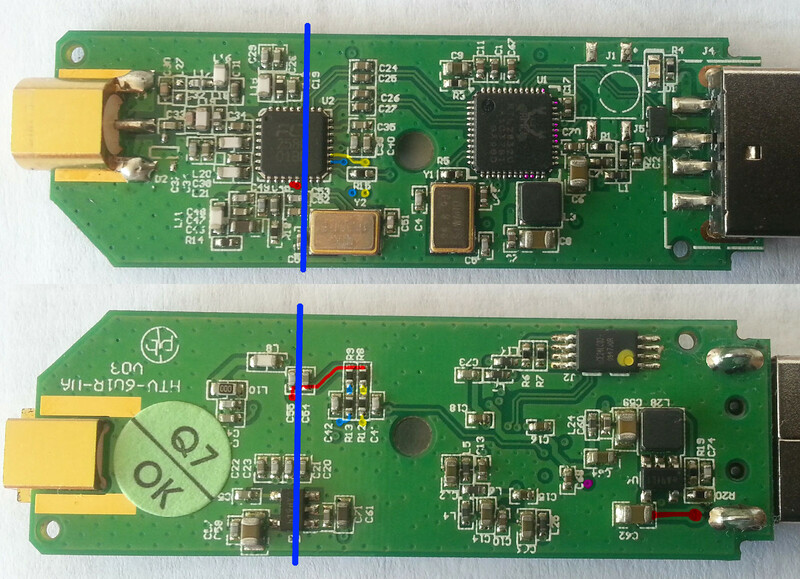 His images prove also that the dongle PCB doesn't do a good job at dissipating heat. Although I'm using a R820T2 dongle (which is said to heat less than the predecessor R820T), I was surprised to see that after only 10-15 minutes the dongle was hot. Opening it up, I discovered that all ICs were hot (the tuner R820T2, the RTL2832U, the 1117 regulator, even the EEPROM was heated inside the closed case of the dongle). OpenWRT/LEDE are Linux based, embedded operating systems for networking devices. Besides being open source, they are highly configurable and versatile. This post will show how to configure one of the LAN ports as WAN input for xDSL routers. The problem with xDSL routers (mainly based on Boadcom platform) is that there are no opensource DSL drivers, so this function does not work. Anyway, many DSL routers are in fact better platforms, with improved hardware, than ordinary routers. If you want to connect the router to wired LAN internet this is what you should do. I've done this on a router with LEDE Snapshot installed (the difference is that snapshots do not come with web interface preinstalled). If you have a regulare release, you can skip LuCI installation, as you already have access to the web interface of the router. 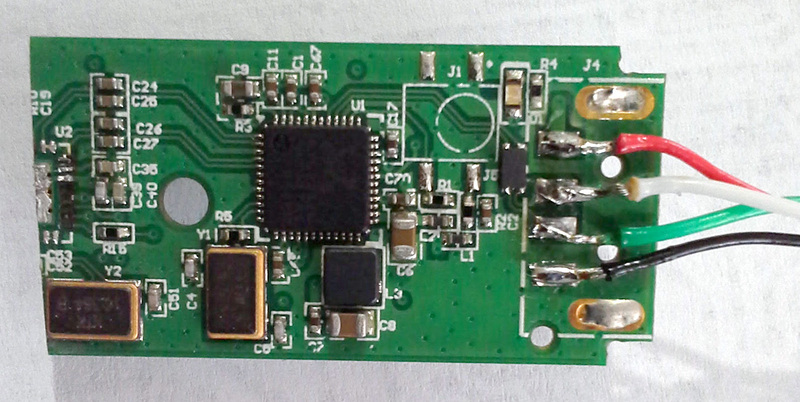 AV4202N is an xDSL modem and WiFi router based on the BCM6368 SoC manufactured by Broadcom. The CPU has 2 cores running at 400 MHz, with 64 MB RAM and 16 MB flash memory. It also has 2 USB 2.0 ports and 2 WiFi internal antennas. Currently, although the BCM63xx platform is supported by OpenWRT, there are no releases for this device. Neither LEDE Project has released a stable build for this device, but they are offering a development snapshot . The problem with LEDE snapshots is that they don't work out of the box without additional software packages (you don’t get any web interface). But, LEDE can’t be installed on the device due to the locked bootloader. 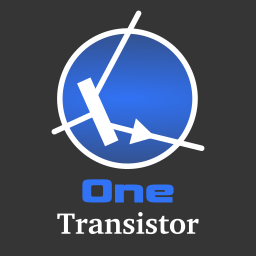 This article will show you how to use JTAG to install a different bootloader that can be used to flash OpenWRT/LEDE firmware. Part 2 details LEDE configuration and internet connection. Note! If the mentioned device was offered to you by an ISP for xDSL internet access, doing what is described next will void the warranty of the device and make it unusable. You should not attempt to change firmware in this situation. Third party firmware does not support xDSL! KiCAD is probably the most complete opensource EDA suite. 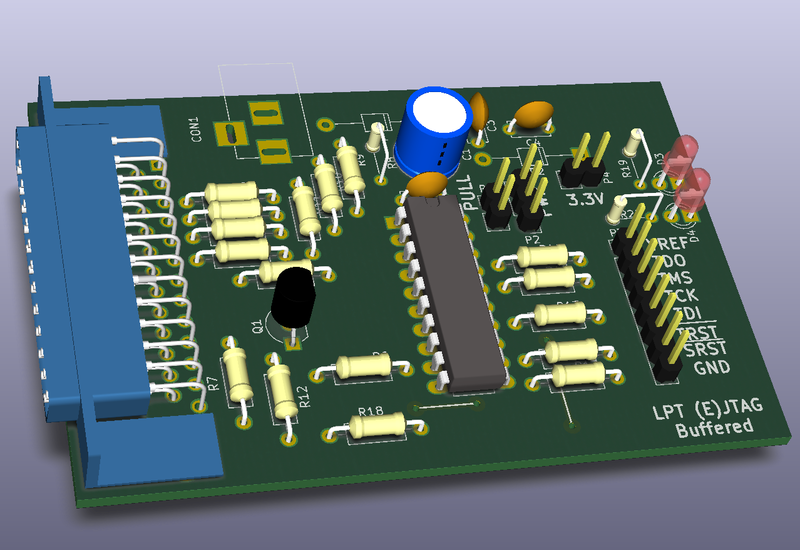 It comes with a schematic editor, a PCB designer and a 3D viewer. PCB designs can be exported to multiple formats or printed directly from the software. Although the plotting (printing) options are quite advanced, there aren't options for overlaying different layers with different colors. This tutorial will show you how to create PCB artwork that looks good on display or print and that is intended only as a guide to the reader, not as a source for manufacturing PCB. 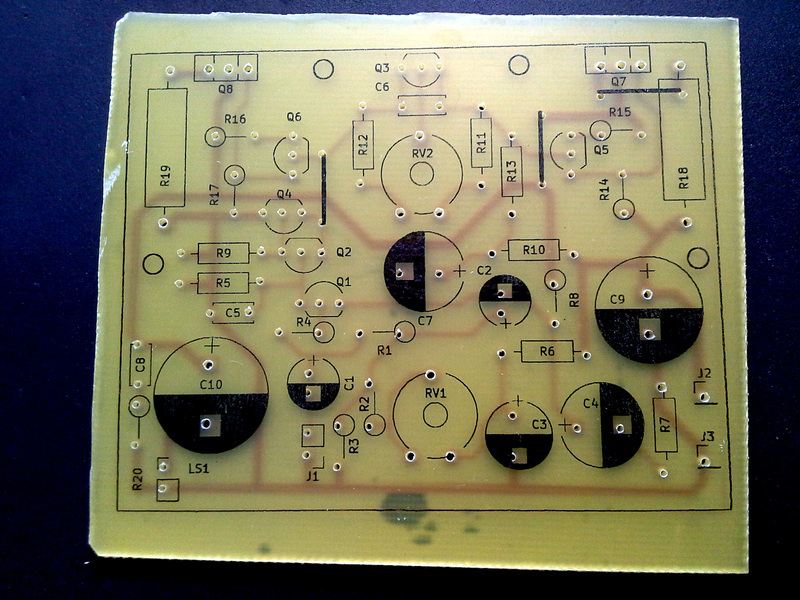 The result will be a greenish PCB (or any color you want) with silkscreen on top of it. This is probably something you already seen in electronics publications. There are many ways of doing this. All you need to start are the PDF files plotted by KiCAD and some image editing software (I prefer opensource tools: GIMP or some ImageMagick scripting). JTAG is an in-circuit programming and debugging interface. 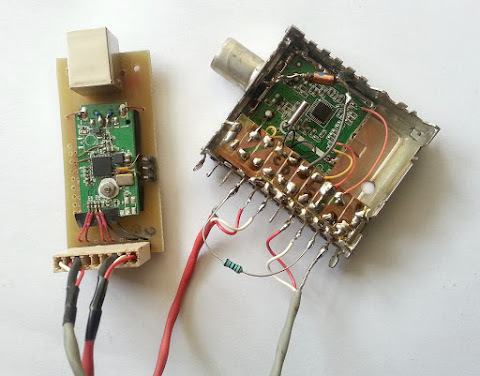 It specifies the use of a dedicated debug port implementing a serial communications interface for low-overhead access without requiring direct external access to the system address and data buses. The interface connects to an on-chip test access port (TAP) that implements a stateful protocol to access a set of test registers that present chip logic levels and device capabilities of various parts. JTAG interface is supported by many devices as a convenient way of rewriting firmware (specially boot loaders) when other methods fail. Using JTAG, the ROM memory can be directly written without desoldering it from PCB to program it using a specific programmer. In most cases, you will need JTAG access to a device with a no longer working bootloader. Otherwise, if the bootloader runs, there should be easier ways of debricking the deice. Most of the times, a device with corrupt bootloader will not display any signs of working (i.e. no LEDs turned on in case of routers, no display on front panel of set-top-boxes). Nor any ports of the device will work (i.e. no serial port response, no network detected). Qt Creator is the IDE (integrated development environment) used by Qt SDK. It is a powerful piece of software that runs on Linux, Windows and macOS. Qt SDK is able to style built applications using QSS styles, something similar to CSS standard. Qt Creator supports not only C/C++ syntax highlighting, but basically any language through Kate Editor Syntax Highlighting files. These are XML files that define lists of specific keywords. 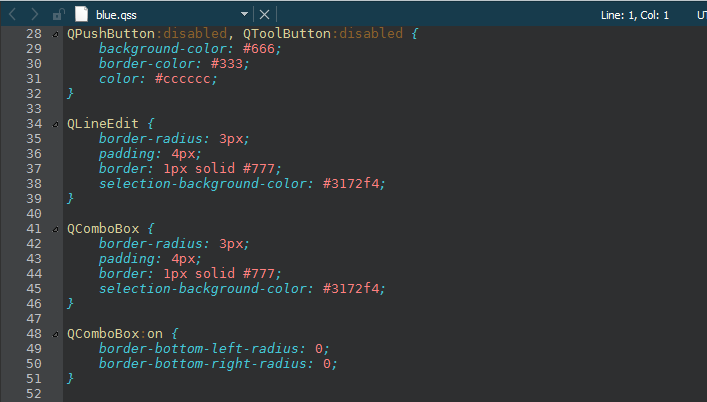 In this way, the Text Editor of Qt Creator is able to style these keywords using a color scheme. Qt Creator doesn't have a default QSS syntax highlight configuration file. And neither Kate. But there are two ways to add QSS syntax highlighting to Qt Creator.